Narmadeshwar Shiva Lingams are found only in one place on the ENTIRE planet: Central India on the banks of the Narmada River. 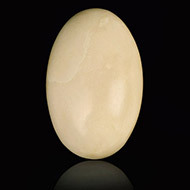 They are composed of cryptocrystalline quartz and have the highest frequency or vibration of any stone on the planet! 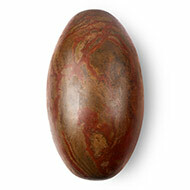 They are formed by the action of the river into natural egg-shapes. 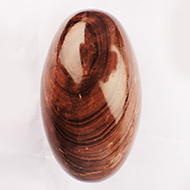 The currents of the Narmada river are very strong and forceful, and the stones are carried from the rocky river-sides, rendering them smooth and polished. They are gathered by certain families (who hold the "right" to do this...which is passed down through the generations). 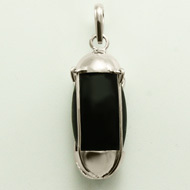 The stones are then polished with mud , dung and natural oils until they have a smooth finish. 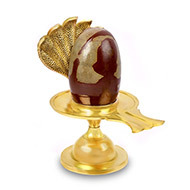 The egg- shaped stone, itself, represents the pure consciousness of Shiva and the markings on the stone represent the active aspect of Shakti. 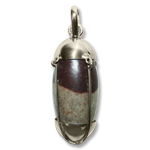 Together, they represent the union of Shiva and Shakti. They are an "aniconic" worship form (abstract) and can be a way of transitioning between murtis and the formless. 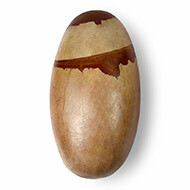 The Lingam is considered to be the "form of the formless". Omkareshwar, one of the famous 12 Jyotirlingas, is a beautiful self manifest Linga on the banks of the holy river Narmada. Several scriptures extol the virtues of worshipping the Narmada -Linga. 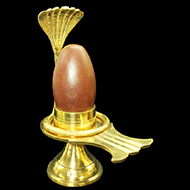 What Salagramas are to Vishnu, the bana-lingas are to Shiva - sacred and self-manifest representations. 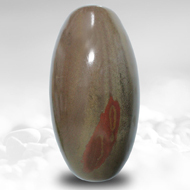 If the Salagrama are stones found only in the Gandaki river, the bana-lingas are stones found only in the Narmada river. 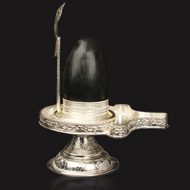 According to Yajnavalkya-samhita, the bana-lingas obtained in the river Narmada are the very forms of Siva assumed by the God at the request of Banasura and are therefore the holiest of objects. 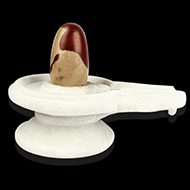 Worshipping one bana-linga gets the benefits that can be procured by worshipping a crore of other lingas. According to scriptures, one can simply keep them in pooja and worship and there is no need to ceremonially instal the bana-lingas. They do not require the normal ritual of invocation of divine presence (avahana) etc, for the divine presence is already there, and will continue to be there quite independently of any rituals. Its worship is said to secure worldly welfare as well as emancipation from worldly involvement. 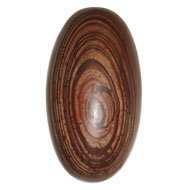 It is therefore claimed that the bana-linga when worshipped is a thousand times more effective than any other linga. 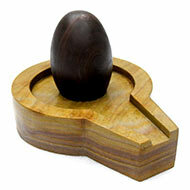 As per Agama Shastra, there are two acceptable orientations of the Shiva Linga. 1. 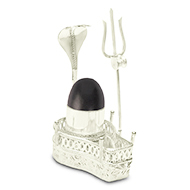 The Yoni base facing the North and the devotee facing the East (towards the West face of the Lingam). 2. The Yoni base facing the East and the devotee facing the North (towards the South face of the Lingam). The Yoni base here shall mean the point from where the Abhishek liquid (Water or Panchamrit) flows out of Shiva Ling.